The FTB8000B series has been discontinued. Please see the FTB8000HW as a possible alternative or contact our Flow Engineering department. The FTB8000B Series meters use the multi-jet principle, which has been an internationally accepted standard for many years. 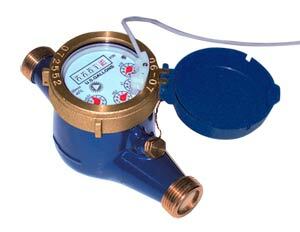 This type of meter is known for its wide range, simplicity, and accuracy in low quality water. The impeller is centered in a ring of jets, with inlet jets on one level and outlet jets on another. A gear train drives the register totalizer dials. For pulse output, one of the dials is replaced by a gear, which turns a magnet that is detected by an encapsulated sensor threaded into the outside of the lens. Pulse rate is determined by the gear and the dial on which the gear is placed. Changing the pulse rate requires no special tools and can be done in the field. Mechanically, all FTB8000B meters are the same. The difference between the -PR, -PT, and standard models is in the sensor. -PR model meters use a solid state, longlasting Hall-effect sensor, which requires power. -PT model meters use a 2-wire reed switch. They provide a dry-contact closure and do not require power. Basic FTB8000B meters totalize only and do not have an output. Never install water meters above or over areas where leakage would cause damage. 참고: Comes complete with 2 MNPT couplings (already installed), 4 m (12') cable, and operator’s manual. Changing the pulse rate requires no special tools and can be done in the field.